If Peter Piper picked a peck of pickled peppadews and publicly taunted us with tongue-twisters, he might have been sued. The word peppadew is a trademark name. Created not by some Big-Ag American conglomerate laying claim to seeds saved by small farmers. No. It was trademarked after a South African fell upon a deviant bush in a garden somewhere in the Eastern Cape in the 1990s, recognized its commercial potential, and set up a growing and pickling operation that, according to my research, remains a secret to this day. Gobstopper-sized, fire-engine-red Chinese lanterns decorate many of our beds during the summer. As such, the peppadew is a recent introduction to the culinary world, and information about this gobstopper-sized, fire-engine-red, Chinese lantern is hard to uncover. 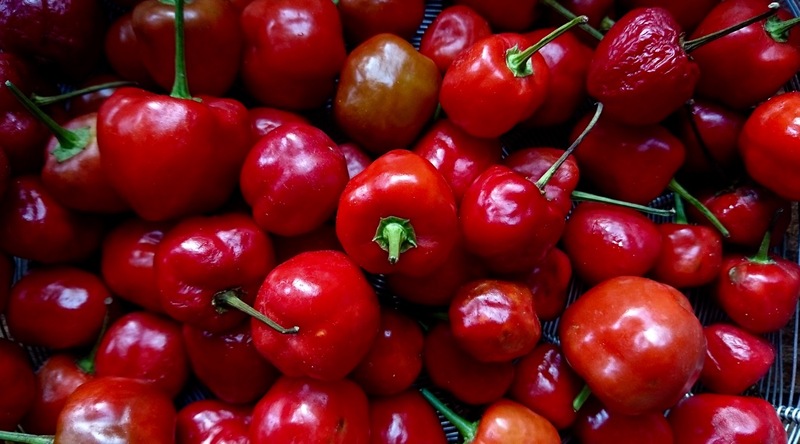 As I read here, “there is a mystery that surrounds the peppadew plant due to the complete lack of availability of its plants or seeds on the open market. It turns out that the distribution of peppadew plant material is strictly controlled and the growers of the peppadew ‘fruit’ are made to sign a contract which, if they are found to be distributing seeds outside the company, could face prosecution from the licence-holding company. So jealously controlled are the movements of this plant that the production fields are actually guarded!” Wow. Luckily for us, my mother sent the peppadew seeds from Zimbabwe, untroubled by “the intense control and security over what is, at best, a naturally occurring hybrid.” I’m unsure how she found them — I daren’t ask in case the aforesaid company tries to sue her, or me — but there are reports of an active and growing underground movement of incensed, yet passionate gardeners propagating and flogging the seeds as a poke in the eye with a sharp stick to whoever created the trademark. Good for them, is all I can say. Peppadews picked from our garden to preserve last month. Peppadews aren’t the sort of hot that reduces you to tears, like the tiny red and green chillis you find in different Asian cuisines. But if you choose to bite into one, seeds and all, you’ll break out into a sweat, or at least I did. Peppadews, at least in this household, are preserved without their seeds, accenting the sweet mild heat for which they are known. They are a terrific accompaniment to cheese, pasta and salads, and are delicious stuffed with cream cheese. Peppadews are a cinch to grow and a cinch to preserve. Boiling the peppadews in pickling vinegar for just a minute before cooling and transferring to sterilized jars. Prep Step One the day before: In a large pot, dissolve the salt in the water. Cut off the stem of the peppadews, and carefully scrape out all the seeds. Rinse and then add to the salted water (brine), making sure they are all covered. Put the lid on the pot and leave overnight at room temperature. The next day, start by preparing the preserving jars. Heat the oven to 100C degrees. After washing and rinsing the jars, place them on a baking tray in the oven for about 20 minutes. Turn off the stove, but leave the jars in the heat until ready to use. At the same time, soak the jar lids in a bowl filled with boiling water, and then dry well before use. Under running cold water, rinse the brine off the peppadews and leave in a colander to drain. Set aside. Bring the remaining ingredients in Step Two to a boil in a large pot, stirring regularly to make sure the sugar dissolves. Add the peppadews and boil for another minute. Remove from heat and set aside. Fill each jar with the peppadews, followed by the pickling vinegar, making sure they are all covered, while leaving some space between the rim of the jar. Wipe the rims, and secure the lids on each bottle. Allow to cool to room temperature, and then store in a dark place, or once opened, in the refrigerator. Wow, that looks delish! Would you be able to do red and yellow peppers in the same way, perhaps just cutting them to a manageable size?